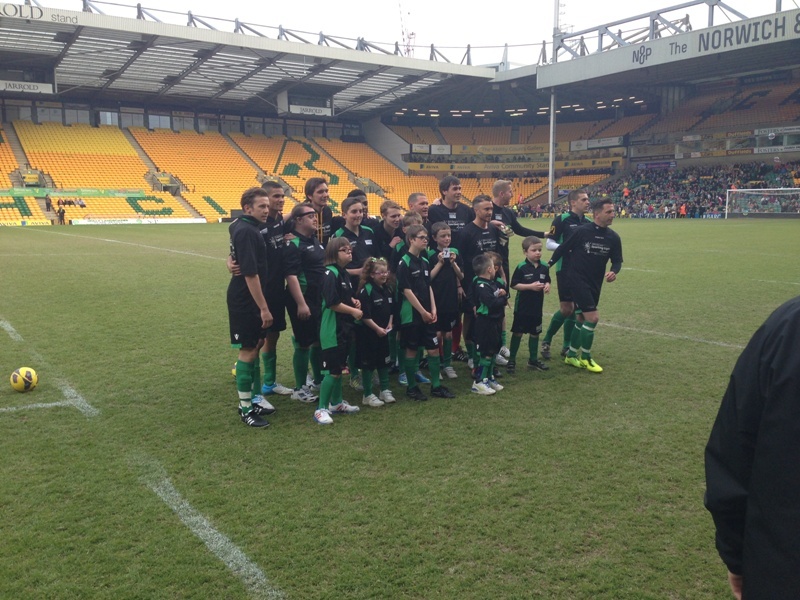 It was a fantastic evening last night at Carrow Road as two teams of celebrities gathered to play in a charity football match to raise money for the Sporting Light Appeal and Community Sports Foundation. The match was called Jamie’s game in recognition of the work of Jamie Abbott, a young football enthusiast who has Down’s Syndrome and ambassador of the Community Sports Foundation. Tens of thousands of pounds were raised for both charities, which will go towards helping disabled and disadvantaged people to get involved in sport. Stars included Mcfly duo Danny Jones and Harry Judd, Jake Humphrey, Jeff Brazier, Harvey from So Solid Crew, Shayne Ward, Comedy Dave, Eastenders star Jamie Borthwick, Matt Lapinskas, Mike Crawshaw and Darren Everest from The Overtones, Tubes from Soccer AM, boxer Anthony Ogogo and many many more. The game also saw some Canary legends return to play including Darren Huckerby, Dean Ashton, Darren Eadie, Adrian Forbes and Iwan Roberts. 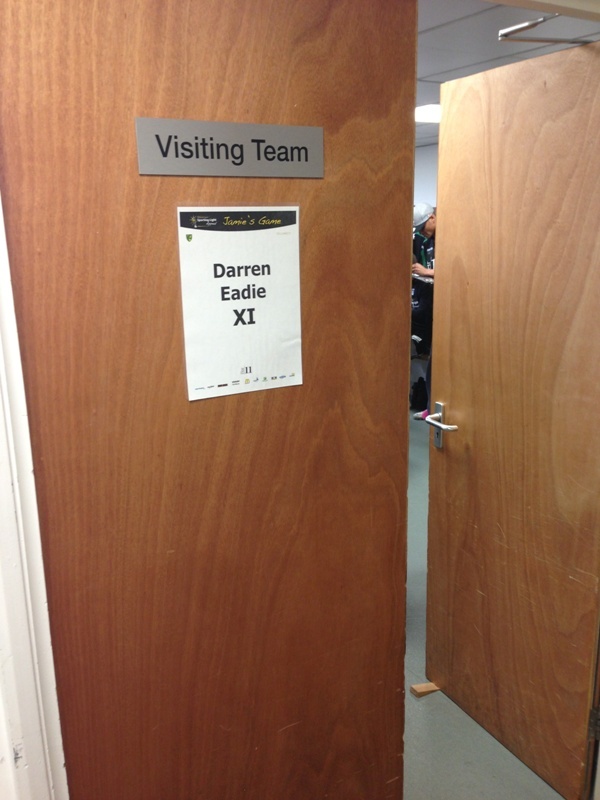 Unfortunately, Dion Dublin couldn’t make it after dislocating his collarbone. The celebrities arrived one at a time and were shown to their dressing rooms where some of the kids who are part of the Sporting Light Appeal football team, got to meet some of the stars. Some of the children’s parents were more excited than the kids about meeting people such as the Mcfly boys, Darren Eadie or Jeff Brazier. As match sponsors Anglian Home Improvements were pitch side before the game, interviewing some of the celebs (keep an eye out on our YouTube channel) as well as young Jamie Abbott who the game was dedicated to. Excitement was in the air and the fans were eager to see their favourite celebrities, whilst the celebrities were nervous and hyped about playing on a Premiership team’s football ground. The first half was a very one-sided affair with Darren Eadie’s team taking an almighty 6-1 lead over Jake Humphrey’s team. Goals were scored by Danny Jones, Lee from Steps, Iwan Roberts, Darren Eadie and Huckerby, whilst MC Harvey managed to get one for Humphrey’s team. According to player manager Jake Humphrey, “it is all part of the plan”. The entertainment didn’t stop at half-time as local singers Tasha Pyne – who got to judges houses in X-factor – and Britain’s Got Talent finalist Ronan Parke took to the stage to sing a few songs. It was a superb half-time show to round off a great first half of football. This was truly a game of two completely contrasting halves as Humphrey’s team made an incredible comeback to steal victory winning 8-7! Matt Lapinskas opened the second half scoring a decent goal and celebrated with a cartwheel and back-flip. Before we knew it the score was 7-7 and in the 90th minute of the game Jake Humphrey was wrestled to the ground, giving the referee no choice but to point to the penalty spot. In true gentlemanly style, Humphrey ran over to the dugouts and summoned Jamie Abbott to come up and take the penalty. He confidently ran up and smashed the ball straight down the middle, past the outstretched keeper! Jamie ran around the pitch celebrating with his team-mates, ecstatic to have not only scored at Carrow Road, the home of his favourite football club, but also the winning goal as the referee blew for full time. At the end of the game, Jake Humphrey’s happy team members, including Jamie gathered around the sought after trophy, lifting it with elated smiles on their faces. This will not only have been a proud moment for the celebrities, Darren Eadie for putting on the event, the charities involved for putting on the event, but also the parents of Jamie, a young sport enthusiast who is an inspiration to us all.